Vertical Call Center Solutions – Fitted To You!!! Industries struggle to search out new revenue streams while simultaneously focusing on how to take more cost out of the operation. VOLARO, a leading technology services company, delivers business solutions, helping clients manage change to drive their business performance. Whatever your business issue, VOLARO offers solutions to help you increase productivity, grow your business and implement practical innovation in a globally secure environment. Do you need to maximize profitability in consumer packaged goods? What about reducing costs in the communications industry? Are you interested in applying Product Lifecycle Management techniques to decrease time to market and increase revenue and profit? If so, let VOLARO show you our documented solutions that match your business needs. 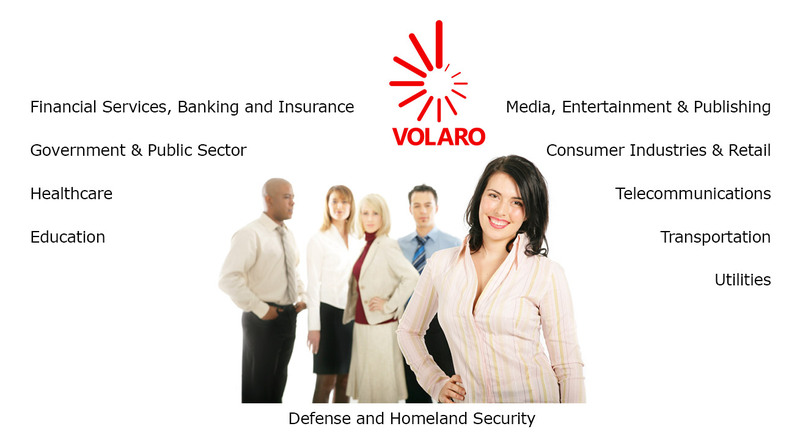 From the moment VOLARO opened for business, our company’s experts have defined the direction of an industry that has become central to any business in any market. Our forward thinking insights and practical implementations have help to shaped IT outsourcing, and continue to set a high standard for others to follow. Through it all, VOLARO puts clients first. We see ourselves as a business ally, working behind the scenes toward a successful outcome for each of our customers. And although our technology services are a central part of that delivery, a deep understanding of the world in which we work elevates our efforts to a higher level.